Translated into English by Lydia G. Cochrane, translation funded by SEPS [Segretariato Europeo per le pubblicazione Scientifiche]. University of Chicago Press, Chicago and London, 2007. 9� by 6 inches. 252 pp. 6 full color plates. Complete Köchel list of works, translator�s notes, index, bibliography. Having shared a household with two Mozart fanatics for the past 18 years it is nice for me to finally catch up and find a framework for all the bits and pieces of conversation that have surrounded me during that time. I recently read Jeremy Siepmann�s fine, brief biography of Mozart, a work aimed at the general public and perhaps also suitable for clever secondary school students. Melograni says he was at first commissioned to write a Mozart book for young people, but decided not to in part because once he began he found the subject so fascinating he knew he would have to write a serious and comprehensive work instead. Melograni�s work is beautifully written; an enormous amount of information is presented so felicitously that you read through the book rapidly � I read it in a day � but end up learning more than you usually would in reading several books. Melograni frequently contrasts and compares his observations with those of Maynard Solomon and Wolfgang Hildesheimer as well as a number of other critics, in effect reviewing his own book as he writes it, and addresses public misconceptions promulgated by the film Amadeus. The result is that every idea is presented in well thought out, digested form, along with alternative interpretations of the data. Mozart emerges from these pages much more alive than I have ever previously known him, a richly complex character living an amazing life in his brief 35 years. The book is divided into chapters which are further divided into sections headed by the main events and years they occurred, making it easy to go back and check facts, and also helping to organize the material for easy comprehension and recollection by topic. He is able to do this with a minimum of looking forward or backward in time, fleshing out events but keeping the narrative moving forward. The author agrees with pretty much everybody that Mozart�s father Leopold was a schemer and blackmailer and lied shamelessly to Mozart to manipulate him into doing what father thought best, and what was best for father. One reason the author shied off writing a book for young people is that he felt young people already have too little respect for their parents and he didn�t want to give them any more excuses. As Mozart reacts to his father�s manipulations and gradually works himself out of his father�s clutches he become more real to me, more human, than he has ever been. The story is gripping, the main reason why you cannot put this book down once you begin it (according to the jacket blurb, Claudio Scimone had this same reaction to original Italian edition of the book). The author does not minimize Mozart�s weaknesses nor his strengths and presents a richly detailed portrait. Mozart�s sister Nannerl also leaps alive from these pages, as does Mozart�s mother, usually a figure ignored in the biographies. Some of the author�s opinions are controversial. He avows that Mozart preferred Amadé to Amadeus. The author thinks the Requiem should be removed from the catalogue of Mozart�s works since Mozart had so little to do with it. In going over the opera plots, he brings out some areas where he feels Mozart reveals his deeper self. He has a suggestion as to why the Mozart family as a whole seemed so interested in defecation. He offers that Joseph II suggested the subject of Nozze di Figaro commissioning Mozart�s opera to further his campaign of limiting the power of the middle aristocracy. He disposes of the poisoning and assault theories and avows firmly that Mozart, possibly like Tchaikovsky later, simply got sick and died during an epidemic like thousands of others at the time. The author clearly loves the music deeply; he defends many of the "minor" works and urges the reader to hear them through, just as he is sure some critics have not. 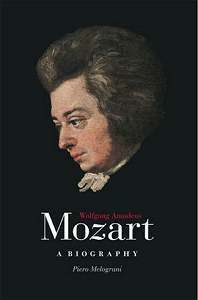 The only illustrations in the book are extremely clear and rich color reproductions of six well known paintings which depict Mozart and those around him. The famous unfinished portrait of Mozart by his brother-in-law Lange, made in mid-1791 at a time when Mozart was supposedly in perfect health, shows a man who is tired and unwell. It is perhaps not surprising that he could fall victim to an epidemic later during that year. Since the author discusses Peter Schaffer�s play Amadeus and the film by Miklos Forman made from it, it might do to go over just what the problems are here. Schaffer intended to write an allegory, using the Salieri/Mozart legend, first written about as an entertainment, by Pushkin, as a vehicle. It�s a clever idea that a jealous, mediocre man could kill a compulsive genius by pulling the music out of him faster than he can endure, of burning him to death with his own divine fire of inspiration coursing through him at a fatal intensity. On the stage it was just that, an allegory, a fairy tale. But with F. Murray Abraham�s incredible creation of the character of Salieri, and the temptation of what is possible with modern film technology, in the movie everything got out of hand. The movie doesn�t look like an allegory the way a stage play does, it looks like reality, so the deliberate falsehoods can have a damaging simulacrum of verity. Salieri was a professional colleague, a rival, but he was also one of Mozart�s dearest friends, a man who attended performances of Mozart�s works and shouted himself hoarse with bravos. One of the reasons for Salieri�s success in the absence of great talent is that he was a very nice man. Mozart and Salieri spent many contented hours reading scores together and Mozart addressed him as "dearest father." Salieri had absolutely nothing to do with the Requiem, neither commissioning it, nor writing it down in dictation. It was actually Salieri who was the victim when, after Mozart died and all those in Vienna who had played with Mozart, teased him by denying him what he deserved, Salieri got the blame and everybody turned their game on him. If they had been jealous of Mozart, there was now only Salieri to endure the brunt of their envious attacks. Salieri�s great talent lay in his ability to find felicitous musical phrases to set Italian words so that they were clearly comprehensible to the audience, an talent brought to the fore in his greatest success, the comedy opera Tarare. His other operas were based on good traditional librettos, so the absolute quality of the music, admittedly bottom drawer stuff, had little to do with pleasing an audience who wanted an evening at the theater with colorful costumes and sets, a simple story they could follow easily, and music to accompany their conversations. Mozart was actually criticized for writing music that was too interesting, too complicated. Joseph II really did say "too many notes" when he commented on Mozart�s first Vienna operatic success Die Entführung aus dem Serail. But uncannily, when I read in this book extended quotes from Mozart, I heard them in my mind in Tom Hulce�s voice. I think Hulce really did study Mozart�s character and style, and his delivery must have had an authenticity to it. At any rate, the movie Amadeus propelled Mozart�s fame to the absolute rafters. Even today people who don�t like classical music listen to Mozart because they enjoyed the movie which was able to make the music seem real to them. Beethoven and Bach should be so lucky.